A hat-trick from Sophie Bray helped East Grinstead secure their place in the end of season play-offs, as they beat Bowdon Hightown 4-0 in the Investec Women’s Hockey League Premier Division on Saturday. Laura Unsworth gave the home side the lead in the 23rd minute when she slotted in from free play. Sophie Bray added the second of the game in the 45th minute before adding another on 51 minutes, both goals coming from open play. She then completed her hat-trick and sealed all three points with another field goal in the 64th minute. Last season’s champions Surbiton lost ground at the top of the table as their match with relegation-threatened Slough ended 0-0. Although Slough picked up a point, they remain in ninth with one game to play and could face the relegation play offs to secure their top flight survival. The University of Birmingham moved two points clear of their relation rivals as they won 5-4 at Buckingham. The away side took the lead in the sixth minute with a goal from Lily Owsley, before Harriet Mitchell made it 2-0 in the 10th minute. Holly Hunt added a third in the 13th minute and its was soon 4-0 as Elena Emo slotted in from free play in the 18th. Buckingham hit back with a brace from Phoebe Richards and goals from Natasha James and Millie Holme to level the game in the 53rd minute. But the University of Birmingham went on to find the winner in dramatic fashion when Amelia Andrew scored from a penalty corner in the 63rd minute. Top of the table Holcombe continued their good form with a 4-2 win at home against Clifton Robinsons. Goals from Leah Wilkinson, Emma Trunks, Joanne Westwood and Dirkie Chamberlin were enough to seal the win the home side. Elsewhere, Beeston won 2-1 at home against bottom of the table Canterbury. Eloise Stenner gave the home side the lead in the second minute before Rebekah Walker doubled their advantage in the 38th minute. Grace Balsdon scored a consolation for the away side in the 46th but Beeston held out to secure all three points. 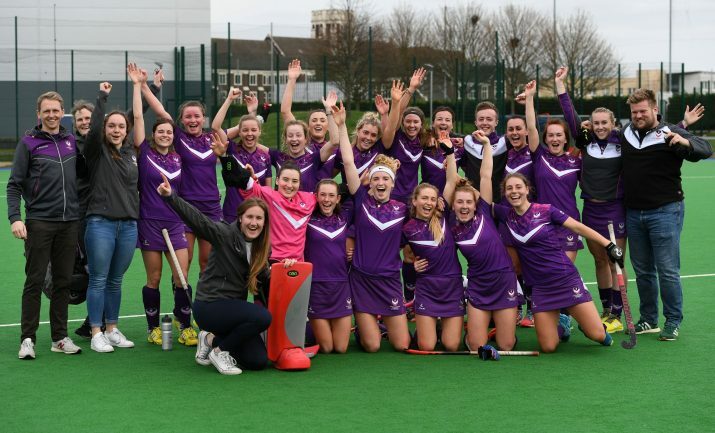 Loughborough Students clinched the Investec Women’s Conference North title with a 4-0 win at home against Fylde. A brace from Lucy Millington and goals from Sophie Byrne and Jen Park were enough for the home side to seal all three points and maintain their unbeaten record in the league this season. Second-placed Leicester produced a good performance, winning 5-1 at the University of Durham. Olive Hepi, Katie Mason, Jodie Conelly, Stephanie Hale and Elizabeth Honarmand were all on the scoresheet for the away side. Tess Howard scored a consolation for the University of Durham. Elsewhere, Belper won 4-3 at home against Timperley, Ben Rhydding won 5-2 at home against Sutton Coldfield, and Brooklands-Poynton won 2-1 at home against Leeds. 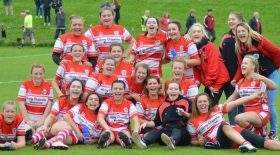 Stourport are Investec Conference West winners following a 4-0 win at Barnes on Saturday. Sarah Parkinson-Mills gave them the lead in the sixth minute with a goal from a penalty corner. Lizzie Pocknell doubled the away side’s advantage with a goal in the 41st minute before Lorna Mackenzie made it 3—four minutes later. Lottie Atkinson sealed the win with a goal from open play in the 52nd minute. Swansea City took a step closer to securing a place in Division One for next season with a 4-2 victory at Olton & West Warwicks. Goals from Beth Fisher, Carmen Ansley, Sarah-Jayne Throrburn and Livvy Hoskins were enough to clinch the win for the away side. Sarah Walton and Laura Collins scored for the home side. Elsewhere, Isca won 2-0 at home against Exe, Trojans won 4-1 at Oxford Hawks and Gloucester City versus Reading finished 2-2. Hampstead & Westminster moved a stop closer to securing the title in the Investec Women’s Conference East with a 5-0 at Southgate. The result means they need a win on the final day to seal the crown. Goals from Melanie Wilkinson (2), Lauren Turner, Amy Askew and Meg Byas were enough to seal all three points for the away side. Wimbledon remain two points behind the leaders after winning 4-0 at Ipswich. Rosie Pickersgill, Hannah De Selincourt, Sophie Bowdon and Kate Maxey were the goalscorers for the away side. Elsewhere, Horsham ran out 3-1 winners at Bedford, St Albans won 3-2 at home against Harleston Magpies, and Cambridge won 3-0 at Sevenoaks. Investec Women’s Premier Division: Beeston 2, Canterbury 1; Buckingham 4, University of Birmingham 5; East Grinstead 4, Bowdon 0; Holcombe 4, Clifton Robinson 2; Surbiton 0, Slough 0. Investec Conference North: Belper 4, Timperley 3; Ben Rhydding 5, Sutton Coldfield 2; Brooklands-Poynton 2, Leeds 1; Loughborough Students 4, Fylde 0; University of Durham 1, Leicester 5. Investec Conference West: Barnes 0, Stourport 4; Gloucester City 2, Reading 2; Isca 2, Exe 0; Olton & West Warwicks 2, Swansea City 4; Oxford Hawks 1, Trojans 4. Investec Conference East: Bedford 1, Horsham 3; Ipswich 0, Wimbledon 4; Sevenoaks 0, Cambridge 3; Southgate 0, Hampstead & Westminster 5; St Albans 3, Harleston Magpies 2.